The New York Giants won their opening game of the 1980 NFL season, but by the time they hosted the Dallas Cowboy s on November 9 they had lost eight straight contests. In their second year under Head Coach Ray Perkins, injuries had decimated the team on both sides of the ball. Third-year QB Phil Simms was a work in progress and had a productive receiver to throw to in WR Earnest Gray, but with injuries badly affecting the rest of the offense, in particular the running game, the Giants had difficulty scoring – they were averaging just 10 points per contest. Likewise, the defense was a patchwork outfit, especially at linebacker. Outstanding players like Brad Van Pelt and Harry Carson were standouts in a patchwork unit. The Cowboys, perennial contenders under Head Coach Tom Landry, came into the game at 7-2 and had won their previous two contests. Despite concerns following the retirement of star QB Roger Staubach after the ’79 season, former backup QB Danny White was playing well in his place. Wide receivers Drew Pearson and Tony Hill were outstanding, and RB Tony Dorsett was one of the NFL’s best. The defense was solid up front, helped by the return of DE Ed “Too Tall” Jones, who briefly retired in 1979 to try his hand at boxing, making up for inexperience in the backfield. There were 68,343 fans present at Giants Stadium in the New Jersey Meadowlands. In the first quarter, the home team got the initial break of the game when LB Brad Van Pelt intercepted a Danny White pass. The resulting drive was helped along by a personal foul penalty called on CB Benny Barnes that added 15 yards to a 22-yard pass from Simms to Earnest Gray. Simms connected with Gray for a 25-yard touchdown and, with Joe Danelo’s extra point, a 7-0 lead. Less than three minutes later, the Cowboys came back with a one-yard touchdown carry by Tony Dorsett that was set up by a pass interference call on CB Mark Haynes. Rafael Septien added the PAT and the score remained tied after a quarter of action. Early in the second quarter, New York CB Mike Dennis picked off a White pass and the Giants drove 22 yards to a one-yard touchdown carry by RB Larry Heater. The next Dallas series was highlighted by a 56-yard Dorsett run that set up a one-yard scoring carry by FB Robert Newhouse. The score was knotted at 14-14. Van Pelt intercepted another pass and the Giants used four plays to score again. Simms threw to Heater for a 29-yard gain and ended the series with a four-yard throw to George Martin, normally a defensive end but lined up as a tight end in short-yardage situations on offense (it was the only catch of his 14-year career with the Giants). Again the Cowboys gave up an interception, this time by FS Gary Woolford. The ensuing possession led to another one-yard touchdown carry by FB Leon Perry, a rookie starting his first game, and, with all of the PATs successful, the Giants were ahead by 28-14. Dallas narrowed the margin before the first half ended with another big play as White threw a screen pass to FB Ron Springs that resulted in a 58-yard touchdown. Still, the halftime score was a surprising 28-21 in favor of the home team. In the third quarter, the Cowboys seemed to take control as they scored another touchdown on a 29-yard run by Newhouse. With the score tied at 28-28, the Giants missed an opportunity when an apparent Simms scoring pass to Gray was nullified by an offensive pass interference penalty on Perry. Dallas proceeded to take the lead as Dorsett ran for a TD from 13 yards out and the Cowboys were up by 35-28 heading into the final period. 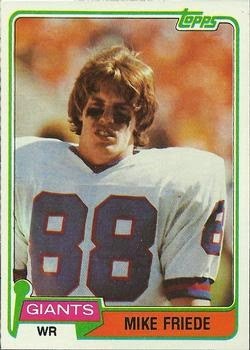 In the fourth quarter, the Giants rebounded with Simms throwing to TE Tom Mullady for a 20-yard TD. The Cowboys fought back as time ran down, but in a key defensive play, Van Pelt (pictured at left) stopped Newhouse short on a fourth-and-one carry at the Dallas 47 and the Giants took over with 2:22 left on the clock. With the rain falling heavily, Simms handed off to Perry, who then flipped the ball back to the quarterback, and he in turn fired deep down the right sideline for WR Mike Friede and a 40-yard gain. CB Steve Wilson slipped and Friede, lunging for the catch, made it to the Dallas seven on the flea-flicker. Three running plays lost two yards and, following a time out, Danelo kicked a 27-yard field goal to put the Giants ahead by three. There was still time for the Cowboys, and White threw to TE Billy Joe Dupree for 24 yards to the New York 46. He followed up by connecting with WR Butch Johnson for 11 yards and then to Drew Pearson, who gained six yards and got out of bounds to stop the clock, which was now down to 19 seconds. The Cowboys decided to try another pass to get closer, but White’s throw intended for Tony Hill was intercepted by Woolford when the receiver slipped and fell down. Woolford barely kept his feet in bounds as he made the catch that nailed down the stunning 38-35 win for the Giants. New York had the edge in total yards (462 to 294) and first downs (26 to 21) despite the Cowboys rolling up 239 yards on the ground. Dallas was hurt by five turnovers, all on interceptions, to two suffered by the Giants, and, in a game with many penalties, the Cowboys were flagged 12 times as opposed to New York’s nine. 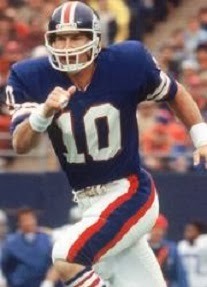 Phil Simms completed 18 of 33 passes for 351 yards and three touchdowns with one intercepted. Mike Friede caught 7 of those throws for 137 yards and Earnest Gray contributed four receptions for 68 yards and a TD. Larry Heater ran for 69 yards and a touchdown on 24 carries and gained another 85 yards on three catches. Brad Van Pelt, who had an outstanding all-around defensive performance, and Gary Woolford each had two interceptions. 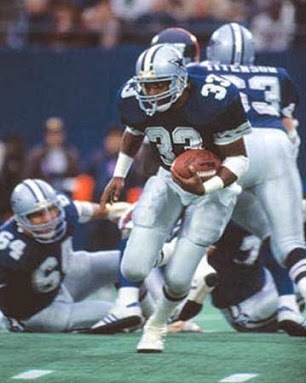 For the Cowboys, Tony Dorsett (pictured below) rushed for 183 yards on 24 attempts with two TDs and Robert Newhouse added 52 yards on 10 carries, also scoring twice. However, Danny White completed just 10 of his 23 throws for 155 yards and a TD, giving up five interceptions. Tony Hill and Drew Pearson each had three catches, for 36 and 22 yards, respectively, while Ron Springs, on his one long scoring catch, led the club with 58 receiving yards. “We practiced it all week, but never in a torrential downpour,” added Leon Perry. The win by the Giants over Dallas was the first since 1974, a string of 12 straight games that included the first encounter of the year between the clubs five weeks earlier. New York put together another solid performance in a win over the Packers the next week, but lost four of their last five contests to end up at the bottom of the NFC East with a 4-12 record. The Cowboys recovered to win four straight and five of their last six, just barely missing out on winning the division title at 12-4. Settling for a Wild Card playoff spot, they advanced to the NFC Championship game before falling to the division-rival Eagles. 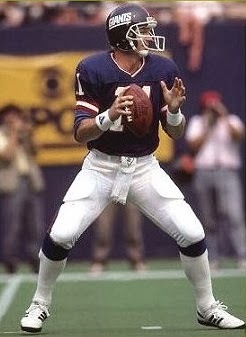 Phil Simms (pictured below) continued his development process until a shoulder injury cost him the last three games of the season. He passed for 2321 yards with 15 touchdowns and 19 interceptions. Mike Friede, a rookie cut earlier by Detroit, proved to be a pleasant surprise for the Giants. He caught 21 passes for 350 yards (16.7 avg.) but lasted just one more season. Tony Dorsett ended up tying for sixth in rushing (with Buffalo’s Joe Cribbs) with 1185 yards – the fourth straight thousand-yard rushing season to start his career. He carried 278 times and had 11 touchdowns.